In The ONE Thing, you’ll learn to * cut through the clutter * achieve better results in less time * build momentum toward your goal * dial down the stress * overcome that overwhelmed feeling * revive your energy * stay on track * master what matters to you The ONE Thing delivers extraordinary results in every area of your life–work, personal, family, and spiritual. 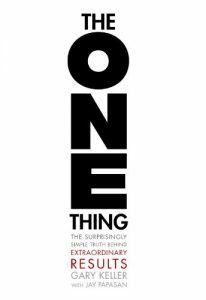 WHAT’S YOUR ONE THING? Click here to buy a copy of this book on Amazon. Curly: Do you know what the secret of life is? Mitch: No. What? Curly: This. [He holds up one finger.] Mitch: Your finger? Curly: One thing. Just one thing. You stick to that and everything else don’t mean sh*t. Mitch: That’s great, but what’s the “one thing”? Curly: That’s what you’ve got to figure out. The way to get the most out of your work and your life is to go as small as possible. Most people think just the opposite. They think big success is time consuming and complicated. As a result, their calendars and to-do lists become overloaded and overwhelming. Success starts to feel out of reach, so they settle for less. Unaware that big success comes when we do a few things well, they get lost trying to do too much and in the end accomplish too little. So when you think about success, shoot for the moon. The moon is reachable if you prioritize everything and put all of your energy into accomplishing the most important thing. Extraordinarily successful companies always have one product or service they’re most known for or that makes them the most money. Through technology and innovation, opportunities abound and possibilities seem endless. As inspiring as this can be, it can be equally overwhelming. The unintended consequence of abundance is that we are bombarded with more information and choices in a day than our ancestors received in a lifetime. Harried and hurried, a nagging sense that we attempt too much and accomplish too little haunts our days. Knocking out a hundred tasks for whatever the reason is a poor substitute for doing even one task that’s meaningful. Not everything matters equally, and success isn’t a game won by whoever does the most. Yet that is exactly how most play it on a daily basis. Instead of a to-do list, you need a success list—a list that is purposefully created around extraordinary results. To-do lists tend to be long; success lists are short. One pulls you in all directions; the other aims you in a specific direction. The one that we decided on was that I would write a book on how to become an elite performer in our industry. It worked. Eight years later that one book had not only become a national bestseller, but also had morphed into a series of books with total sales of over a million copies. In an industry of about a million people, one thing changed our image forever. The payoff from developing the right habit is pretty obvious. It gets you the success you’re searching for. What sometimes gets overlooked, however, is an amazing windfall: it also simplifies your life. Your life gets clearer and less complicated because you know what you have to do well and you know what you don’t. The brain makes up l/50th of our body mass but consumes a staggering 1/5th of the calories we burn for energy. An 11-year study of nearly 7,100 British civil servants concluded that habitual long hours can be deadly. Researchers showed that individuals who worked more than 11 hours a day (a 55-plus hour workweek) were 67 percent more likely to suffer from heart disease. View work as involving a skill or knowledge that must be mastered. This will cause you to give disproportionate time to your ONE Thing and will throw the rest of your work day, week, month, and year continually out of balance. Your work life is divided into two distinct areas—what matters most and everything else. You will have to take what matters to the extremes and be okay with what happens to the rest. Professional success requires it. When people talk about “reinventing” their career or their business, small boxes are often the root cause. What you build today will either empower or restrict you tomorrow. It will either serve as a platform for the next level of your success or as a box, trapping you where you are. Before Sam Walton opened the first Wal-Mart, he envisioned a business so big that he felt he needed to go ahead and set up his future estate plan to minimize inheritance taxes. By thinking big, long before he made it big, he was able to save his family an estimated $11 to $13 billion in estate taxes. Transferring the wealth of one of the greatest companies ever built as tax-free as possible requires thinking big from the beginning. For more than four decades, Stanford psychologist Carol S. Dweck has studied the science of how our self-conceptions influence our actions. Her work offers great insight into why thinking big is such a big deal. Dweck’s work with children revealed two mindsets in action—a “growth” mindset that generally thinks big and seeks growth and a “fixed” mindset that places artificial limits and avoids failure. Growth-minded students, as she calls them, employ better learning strategies, experience less helplessness, exhibit more positive effort, and achieve more in the classroom than their fixed-minded peers. Here’s what I found out: We overthink, overplan, and overanalyze our careers, our businesses, and our lives; that long hours are neither virtuous nor healthy; and that we usually succeed in spite of most of what we do, not because of it. I discovered that we can’t manage time, and that the key to success isn’t in all the things we do but in the handful of things we do well. In Carnegie’s talk, entitled “The Road to Business Success,” he discussed his life as a successful businessperson and gave this advice: And here is the prime condition of success, the great secret—concentrate your energy, thought and capital exclusively upon the business in which you are engaged. Having begun on one line, resolve to fight it out on that line, to lead in it, adopt every improvement, have the best machinery, and know the most about it. The concerns which fail are those which have scattered their capital, which means that they have scattered their brains also. They have investments in this, or that, or the other, here, there and everywhere. “Don’t put all your eggs in one basket” is all wrong. I tell you “put all your eggs in one basket, and then watch that basket.” Look round you and take notice; men who do that do not often fail. It is easy to watch and carry the one basket. It is trying to carry too many baskets that breaks most eggs in this country. How we phrase the questions we ask ourselves determines the answers that eventually become our life. I believe that financially wealthy people are those who have enough money coming in without having to work to finance their purpose in life. Absent an answer, pick a direction. “Purpose” may sound heavy but it doesn’t have to be. Think of it as simply the ONE Thing you want your life to be about more than any other. Try writing down something you’d like to accomplish and then describe how you’d do it. For me, it looks like this: “My purpose is to help people live their greatest life possible through my teaching, coaching, and writing.” So, then what does my life look like? Teaching is my ONE Thing and has been for almost 30 years. At first it was teaching clients about the market and how to make great decisions. Next, it was teaching salespeople in the classroom, during sales meetings, and one-on-one. Later it was teaching business classes. Then it became teaching high performers models and strategies for high achievement, and the last ten years it has been teaching seminars on specific life-building principles. What I teach is what I then coach and is supported by what I write. To be precise, the word is priority—not priorities—and it originated in the 14th century from the Latin prior, meaning “first.” If something mattered the most it was a “priority.” Curiously, priority remained unpluralized until around the 20th century, when the world apparently demoted it to mean generally “something that matters” and the plural “priorities” appeared. With the loss of its initial intent, a wide variety of sayings like “most pressing matter,” “prime concern,” and “on the front burner” pitched in to recapture the essence of the original. Today, we elevate priority to its former meaning by adding “highest,” “top,” “first,” “main,” and “most important” in front of it. People tend to be overly optimistic about what they can accomplish, and therefore most don’t think things all the way through. Researchers call this the “planning fallacy” Visualizing the process—breaking a big goal down into the steps needed to achieve it—helps engage the strategic thinking you need to plan for and achieve extraordinary results. This is why Goal Setting to the Now really works. In 2008, Dr. Gail Matthews of the Dominican University of California, recruited 267 participants from a wide range of professions (lawyers, accountants, nonprofit employees, marketers, etc.) and a variety of countries. Those who wrote down their goals were 39.5 percent more likely to accomplish them. To achieve extraordinary results and experience greatness, time block these three things in the following order: Time block your time off. Time block your ONE Thing. Time block your planning time. Give yourself 30 minutes to an hour to take care of morning priorities, then move to your ONE Thing. My recommendation is to block four hours a day. Like so many other successful writers, early in his career King had to find his time blocks where he could—mornings, evenings, even lunch breaks—because his day job didn’t accommodate his ambition for his life. Once extraordinary results started showing up and he could earn a living from his ONE Thing, he was able to move his time blocks to a more sustainable time. To experience extraordinary results, be a maker in the morning and a manager in the afternoon. “Until My ONE Thing Is Done—Everything Else Is A Distraction!” Try it. Put it where you can see it and others can see it as well. The people who achieve extraordinary results don’t achieve them by working more hours. They achieve them by getting more done in the hours they work. Most assume mastery is an end result, but at its core, mastery is a way of thinking, a way of acting, and a journey you experience. An accountability partner isn’t a cheerleader, although he can lift you up. An accountability partner provides frank, objective feedback on your performance, creates an ongoing expectation for productive progress, and can provide critical brainstorming or even expertise when needed. I discussed Dr. Gail Matthews’s research that individuals with written goals were 39.5 percent more likely to succeed. But there’s more to the story. Individuals who wrote their goals and sent progress reports to friends were 76.7 percent more likely to achieve them. Personal energy mismanagement is a silent thief of productivity. You’re not focused on having a perfect day all day, but on having an energized start to each day. If you can have a highly productive day until noon, the rest of the day falls easily into place. Write down your current income. Then multiply it by a number: 2, 4, 10, 20—it doesn’t matter. Just pick one, multiply your income by it, and write down the new number. Looking at it and ignoring whether you’re frightened or excited, ask yourself, “Will my current actions get me to this number in the next five years?” If they will, then keep doubling the number until they won’t. If you then make your actions match your answer, you’ll be living large. For me, very few books cause tears, much less require a handkerchief, but Bronnie Ware’s 2012 book The Top Five Regrets of the Dying did both.